I am so traumatized feel asleep early - woke-up to find the youtube of Dr Andrew Fagelman's violent lying attack receptionist Delita Hooks broke 260,000 views -- thanks and gratitude I want over million views every day that they lie and blame me is the day I'm going to ask you to Facebook it tweet it on him never to treat a patient violating my patient rights instead of apologizing hitting me over and over making a hole in my retina cervical damage she even pressed her barefoot against my vaginal area you see her in the three women in medical PJs they all lied so please continue to help. Not fired or arrested. https://www.scribd.com/mobile/doc/173385168#fullscreen Delita Hooks false cross complaint I paid 15 dollars to get she walked in to 01 Precinct 2 days after me and committed yet another crime. I had to fill out this form and the employee from 1 Police Plaza filled out the bottom paragraph with all of Delita Hooks lies except for 1 she admits she knows I was a patient. in a sea of bullets for no longer agreeing to take the abuse! ABUSIVE ELEPHANT VERSION OF A PUPPY MILL! 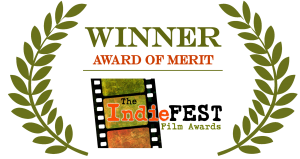 Winning an IndieFEST is something you and your entire team can be proud of! Our judges base their decisions on the quality, creativity and technical aspects of each piece. The award appropriately reflects the endless hours you and your team have spent to create your outstanding production! Congratulations on your achievement!" We are working in the background on "other things" that I will email you when the timing is right, as that information isn't intended for public display. Much Gratitude from all of us in the Gods in Shackles Team!! Congratulations to all of YOU!! At the end of the day the elephants are the winners, as the message is now spreading globally, and seeping into India as well. Reply directly to this email to respond to the campaign owner, Sangita Iyer. Visit the campaign page to view all comments and updates for this project. America and too many People around the world have no idea that Elephants face extinction in the Wild and all elephants in captivity have been stolen away, horrifically abused including Zoos but the worst are Elephants BEATEN gang beatings in to submission and Kim Basinger was cutting edge with Montel Williams sharing the horrific truth behind Circuses and Elephant rides. and there is recent video of her abuser pulling food away from her! Kenzie is a brave 17 activist who received this a beautiful letter from Kim Basinger as People around the world continue to demand Nosey a dear elephant who is suffering be retired to a sanctuary. 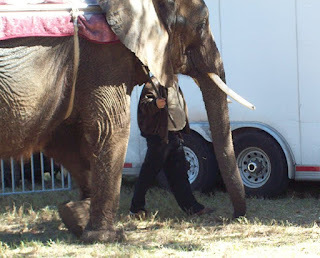 Rebel Mouse has extensive coverage of the on going actions to save Nosey. the USA = thank you Kim for speaking up so long ago. *Kenzie is the 17-year old daughter of Jennifer Hurlburt (AFNN) They helped Richard Isley Director of the California Institute on Nosey's storybook, and Kenzie wrote the letter to the president in the book. 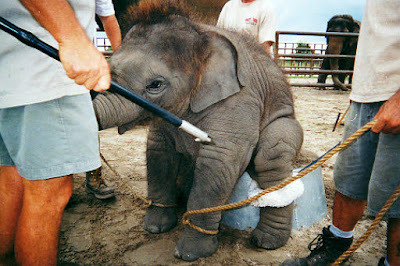 PLEASE sign every petition on elephants -- just google Elephant petitions..
and they still lose many babies to broken hearts. Please donate to this film with the goal to stop the abuse of elephants it's a free piece temple elephants that suffer every single day horrific torture I donated. We are also trying to free Nosey an abused elephant from babyhood as well forced to perform and we want to real sanctuary for elephants were there not lab rats and abused is happening right now in Florida thanks to Ringling. Obama via spokesperson Attacks Schumer on Homeland Security Behind the Scenes? There is 1 other payback issue gee what's that...? "WASHINGTON – In extraordinary attack, the White House on Wednesday slammed Sen. Charles Schumer for criticizing the administration’s proposed cuts to homeland security funding – labeling Schumer “wrong” and even calling his “credibility” on homeland security into question by digging up a sore point in his voting record. Obama -- anti-Hillary move but also a slap in the face to Bloomberg, Ray Kelly, de Blasio and Bratton and I am alleging a lot of tax dollars including 911 money has been stolen here in NYC defense contractors, lobbyists, consultants some retired NYPD behaved like Wall St Titians responsible for the Wall St Implosion!!!!!!!!! FirstNet is a 7 billion dollar rip-off scandal and Ray Kelly's pick chief of kick backs Chuck Dowd was cleverly booted by Bratton who first hosted a FirstNet boarding meeting a 1 police plaza (exclusively and only reported by me) pre the Federal Investigation of FirstNet. He looks like he needs medical care and a home. Deeply moving -- I cried -- I had no idea about Elephants being stolen away as babies beaten gang beatings to make them submissive around the world including the USA = thank you Kim for speaking up so long ago. 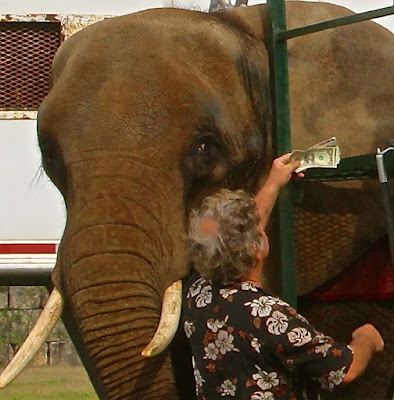 the horrific beating of baby elephants and grown elephants must stop and right now Barnum's fake sanctuary in Florida still is abusing elephants. Watch the Montel Williams segment see a poor elephant being beaten over and over -- the trainers use bull hooks, electric shocks and deprivation of food on elephant babies and adults -- spread them eagle and torture them and this goes on to this day. 1) Watch this and google elephant petitions and sign them all and get involved -- join us helping to Free Nosey and donate like I have to a film Gods in Shackles about the horrific on going torture abuse of India's Temple elephants -- PLEASE FORCE YOURSELF TO WATCH THE Kim Basinger Montel Williams segment and see the open torture gang beatings of elephants. It is amazing more elephants have not fought back killing their abusers. http://www.seashepherd.org/milagro2/ CLICK LINK SEE PHOTOS OF VAQUITA --- AMAZING STRIKING LIKE MINI SCI FI DOLPHINS -- IF YOU CAN DONATE!!!!! Vegan cook book and woman's Sea Shepherd sweat jacket! Breaking CityTime Carl bell sentenced time served, 3 years probation while CityTime crooks appeal their appeals. CityTime still not over and Destin for the dumpster possibly along with 911 even figure figure titanic hunk of junk like CityTime. Rudy Giuliani gave us hunk of junk CityTime and Mike Bloomberg should've thrown it out and he didn't and worse he gave us 911 tech corruption the biggest scam corruption ever New York City government. The second backup unit command center in the Bronx for 911 is years behind schedule originally planned 2012 it's still not up and is now a $900 million project and before Bloomberg left office 911 went over budget $1 billion under Mike Bloomberg Christine Quinn and whistle blower told me the whistleblower contacted both of them with evidence and DOI said no foul. NYC gov 911 scandal bigger than CityTime -- rewind Jun 21 2013 I testified at City Hall --- at the time 911 2nd Command Ctr 1 yr behind schedule 50 million--- suppose to be completed 2012 see NYC gov document below stating 2012 completion date now 900 million dollars price tag due to open Summer 2016 How about Accountability answers???? 911 Tech system a bigger scandal and crime than CityTime (NYC gov's still flawed payroll system) is still not front page news and it should be. Mayor Bloomberg left office with the 911 tech system being over budget by 1 billion plus tax dollars but no investigative journalist has touched on the fact the 2nd emergency command center located in the Bronx is still not up and was suppose to be completed in 2012!!! Somewhere along the line it was decided to take the back up command center at the time already a year behind schedule in 2013 at a 50 million dollar price tag and up spending to a 900 million dollar emergency "campus" is what I call it and MOST NEW YORKERS HAVEN'T A CLUE because there is not transparency. Because of Sept 11 it was decided to put the emergency command Center in Brooklyn -- contractors starting with Hewlett Packard were openly stealing -- over billing -- Mark Peters under Bloomberg in now on the record stating over billing isn't stealing. It is. Like CityTime the 911 tech system was a hunk of junk. Mayor de Blasio came in and said he fixed what was broke...but has he? Why isn't anyone answering questions on the 900 million dollar back-up unit in the Bronx? I know from my testimony at City Hall when Ariel Russo's parents testified before me -- that if any backing up of 911 is need the calls will be re-routed to 911. What isn't talked about is this 911 nightmare is Bloomberg and Ray Kelly's baby and they should be questioned and under oath. I took a screen shot from the page below --- if you use my work can you credit me please? It says the 2nd command center in the bronx was suppose to be done 2012 -- I testified at City Hall 2013 --it still was not done. I remember Gale Brewer was as upset as I was and at the time it was 50 million so explain how it ballooned up to 900 million dollars -- where did that 900 million come from as the 911 project at that time under Bloomberg was already 1 billion dollars over budget. if we had a large scale terrorist attack post 9-11 -- the 911 tech scam of the century under bloomberg and not bloomberg federal program FirstNet 9 billion two biggest scams in response to 9-11 -- this kind of spending and lack of accountability is like Wall St activities that led to an implosion? Where is the transparency starting with 911 -- how about full accounting -- flow charts including contractors lobbyists nyc gov offices consultants and when the 2nd back up unit went from 2012 completion 50 million to 900 million 2016 competition. The youtube contains my testimony and Liz Crowley said she would look in to my allegations -- fyi - I have a powerful witness who stood with NYPD and he said the ambulance was late -- now a new reporter aid Mark was shot in the head and it didn't matter but I say it did and if St Vincent's was open possible maybe Mark would have been alive --why was the ambulance late? No answer from Liz Crowley. I JUST CALLED LIZ CROWLEY THIS AM LEFT A DETAILED VOICE MAIL ABOUT MY TESTIMONY DATE AND WAITING TO HEAR FROM HER ALL THESE YEARS LATER AND WHY THE COMMAND CENTER YEARS LATE -- WHY WHEN IT BECAME A 900 MILLION DOLLAR PROJECT? Do you think Liz Crowley's staff will call me back and give me answers? https://www.youtube.com/watch?v=G8dfDq74mO4 first I tell you about testifying and than you can hear my testimony…. I stood outside City Hall at 9:30 am to testify 10:30 City Council Meeting on 911 which started 1/2 late. Mayor Bloomberg's Deputy Mayor Cas Holloway did a 2 hour infomercial most though was a blatant lie 911 works. at the time it was a 50 million dollar project and already a year late! the article says the city says it is in budget but is it really? the 900 million — is that part of the 2 billion dollars spent before Bloomberg left office or 900 on top of the 2 billion — the original budget is 1 billion under bloomberg like CityTime sky rocketed to 2 billion dollars…. I knew Cy Vance is a dirty DA worse than Hynes in a shorter amount of time -- he refused to prosecute 911 crooks like they were Goldman Sachs royalty teflon in 2012 when the back up center already 50 million dollars was a year behind schedule -- I am guessing the powers that be knew the real price tag was going to be 900 million dollars and how could they justify spending close to a billion dollars on a 2nd command center still not up and running in 2016 with contractors and key officials maybe top NYPD in handcuffs. also I bumped in to Ray Kelly and gave him my Justice card about the NYPD coercing me and fixing crime like a las vegas casino and than I met NYPD Chief Dowd inside before I testified -- I handed him my Justice card not knowing as per NYDN he was caught fixing crime and promoted my Ray Kelly and he read my card and refused my testimony.....when I introduced myself he refused to tell me what he was Chief of as if he was ashamed and I told him protocol requires he identity himself so he said he was chief of technology! Terrorism Reality NYC 911 Scandal 900 Million $ Bronx Command Center Yrs Behind Schedule? Where is a full disclosure of all tax payer $ on 911 from the beginning when IXP pushed out Verizon protected later Verizon was forced to pay back $50 million to the city later on Verizon was caught giving head of NYPD technology Chief Chuck Dowd gifts internal affairs was OK with that I audiotaped IA posted on YouTube! I don't believe the common in this Bronx article about the budget and I want a full accounting transparency and FrontPage articles because this is about our safety! I testified at City Hall we need a criminal investigation at the time I did not understand and it is in my new lawsuit in New York State Supreme Court that 911 was and is the NYPD's baby so Ray Kelly and chief Chuck Dowd have a lot of explaining to do along with Mike Bloomberg and key New York City officials and lobbyists under oath along with the past and current heads up Dept Of investigation so that would be Rose Gill Hearn and Mark Peters. Why isn't this front page news especially when we have Mike Bloomberg considering running for mayor and it's obvious why Ray Kelly blocked from becoming head of Homeland security and it wasn't just his stance on stop and Frisk and Eric Garner's handwritten lawsuit. Kelly said 911 worked during hurricane Sandy but the phone lines didn't work FYI Verizon had to pay the city back $50 million on 911 and they were not even the lead contractor Hewlett Packard who is far more guilty!!!! @PreetBharara @AlanChartock @SDNYnews 911 from Bloomberg Kelly to now over 3 bill$ &amp; FirstNet 7 billion $ both response to 9-11 = scam? If you follow the link on city council you'll see a mayor Bloomberg posted in New York City government website it's in NYPD website that gives you a clue how big NYPD's role is in 911 wrong doing along with the Bloomberg administration. Mark Page and Bloomberg simple math at Harvard along with anyone who could do simple addition Hewlett-Packard open the floodgates stealing and mysteriously the second command centers not up and running and it's a $900 million price tag no one's talking about it how many years is it gonna take to get that up and running specially with the possibility of terror attacks!!!! Bloomberg's right hand Harris put her son into top position in technology with Bloomberg sisters best friend. If you take my work can you credit me ??? HOLY COW -- ARE YOU KIDDING ME? This week we're working hard to connect NYC animal lovers voters with their council members. When the vote on the new carriage proposal, Intro 573B, happens thisFriday, February 5th, it's essential that the Council Members know why it's so important. This link will let you easily email your Council Member and ask for a YES vote for Intro 573B! You're not the only one reaching out - check out rockstar P!nk speaking out for horses! This bill will provide important new protections for the carriage horses and we need to speak up for that. Join celebrity activists like P!nk and send your Council Member an email right now to ask for support. You can let the Council Members know that Intro 573B protects the horses by keeping the carriage horses off of busy NYC streets, restricting them to Central Park only, providing better living conditions with larger stable stalls, restricting work hours, prohibiting the horses from going slaughter, and ensuring that the horses are retired to loving sanctuaries. Thank you for sending your council member an email with this link! Change is coming because of passionate supporters like you. This email was sent to Sbtfaith@aol.com. To stop receiving emails, click here. You can also keep up with NYCLASS on Twitter or Facebook.